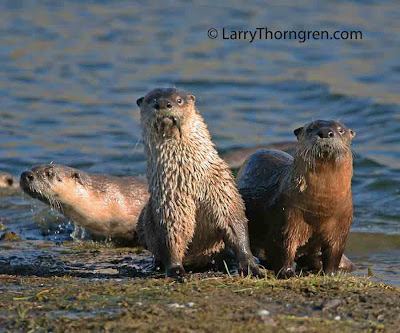 I had observed these River Otters come out on the bank at intervals, as they swam down the Yellowstone River, to mark their territory with urine, much like dogs and wolves mark their territories. So when they started swimming downstream, I drove my truck a mile or so down river, picked out a similar spot to their last pullout and waited for them to come out on the bank. They seemed quite surprised to see me when they arrived. I was very proud of myself that I was able to predict exactly where they would stop. One of them has a small fish in its' mouth. Labels: River Otters, Yellowstone River.Territory marking.